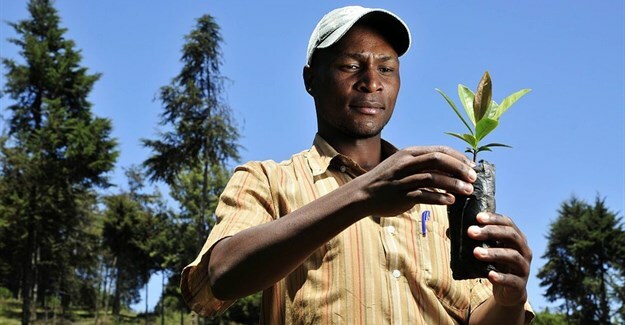 INNOVATING AGRIBUSINESS | Information and Solutions for people, businesses and institutions involved in Food and Agriculture, specially in arid regions and developing world countries. Frank de Hek, Oaklins’ horticulture specialist, shares some high level industry intelligence in a new edition of the company’s newsletter, Spot On. “Oaklins has advised on numerous mergers and acquisitions in the horticultural sector in the last 15 years. At first, small consolidation plays and family succession were the key drivers. 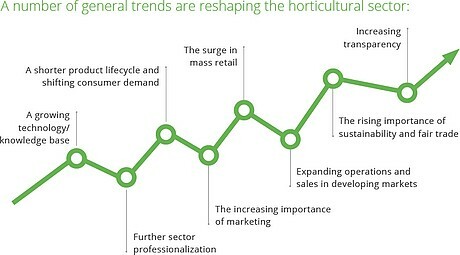 Then the horticultural market went through a globalization wave which is now being followed by another consolidation. 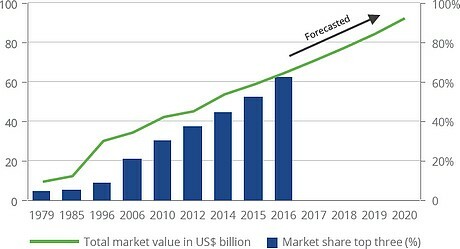 These trends also emerged in the agricultural crop and pharma industries decades ago when the same market drivers resulted in several consolidation waves. Today, there are just a handful of companies that dominate these industries. To put this into perspective, the market share of the top three agricultural crop companies has risen from 5% to more than 60% in the last 35 years, as shown in the graph below. These top three seed companies are Monsanto (USA), DuPont’s subsidiary Pioneer Hi-Bred (Canada) and Syngenta (Switzerland). 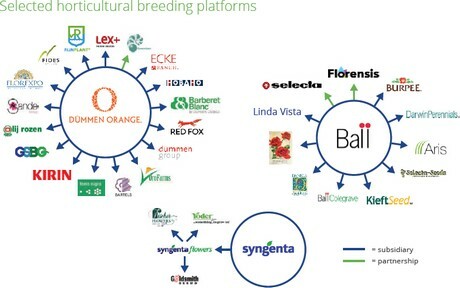 On the mid-term, Oaklins expects 5 to 8 global horticultural breeding platforms with a broad product portfolio to dominate the sector. A select number of single-crop breeders will continue to be successful as well, with key success factors being critical amongst others mass and global activities. The transformation and consolidation in the sector will be facilitated by private equity firms, whom are actively looking to create new consolidation platforms. According to a recent study published by the University of Aalto, Ethiopia is one of the countries with an insufficient and insecure supply of food. The extreme drought in the country, due to the weather conditions, and the unsuccessful strategy for the supply of food products are the main causes for this. However, a social organization called Roots Up may have found the key to tackling food shortages by creating a greenhouse that turns dew water into a resource suitable for irrigation. In addition to offering a possible solution to this problem, it does so with its own production system, which could help alleviate Ethiopia’s dependence on foreign food suppliers. 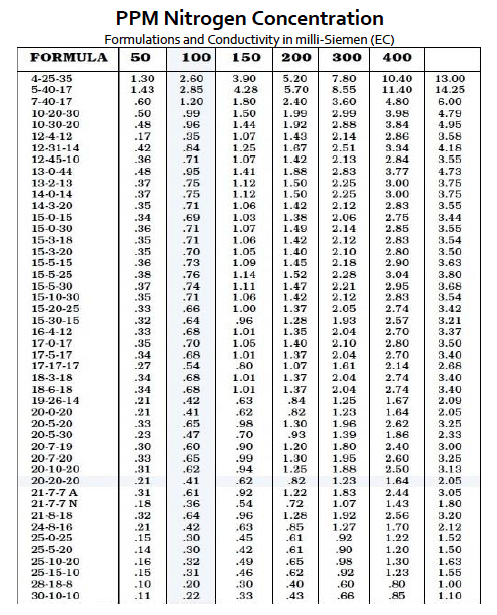 This information, originally published on the website Ecoinventos, notes that dew water could help producers grow fresh vegetables “even during times of drought.” The greenhouse has a dew collector that helps collect this water, which would otherwise be lost in the atmosphere. Thus, growers can produce drinking water for both irrigation and human consumption. 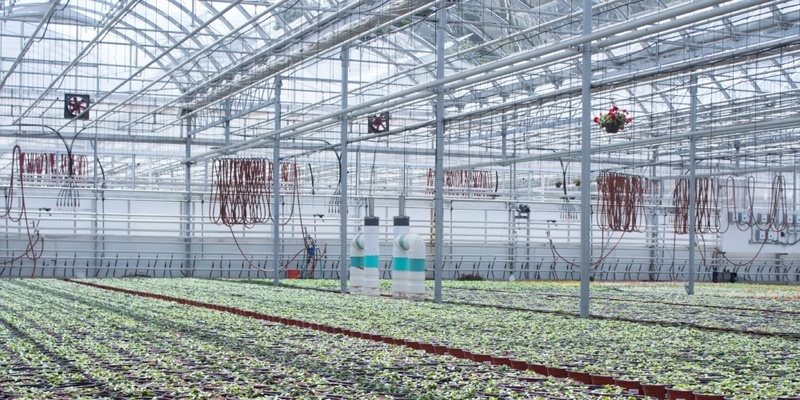 “When temperatures rise with the midday sun, the greenhouse causes the water to evaporate and rise. At nightfall, the upper part of the greenhouse, which opens by pulling the cords tied to a latch, exposes the water drops collected to the cold air. These droplets cool and condense, falling into a storage cistern, “making it possible to use the water,” according to the information of the portal specialised in agricultural technology. With scorching summer temperatures and little rainfall, the barren scrublands around the port of Aqaba in Jordan, one of the world’s most arid countries, might seem ill suited to cultivating cucumbers. 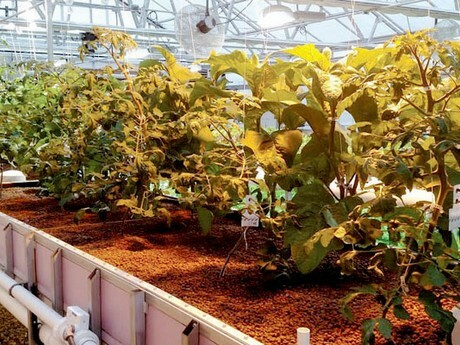 Yet a Norwegian company is setting up a solar-powered, 20 hectare facility that promises to grow a variety of vegetables without wasting a drop of fresh water. “We take what we have enough of – sunlight, carbon dioxide, seawater and desert – to produce what we need more of – food water and energy,” said Joakim Hauge, chief executive of the Sahara Forest Project (SFP). Harnessing abundant resources to generate scarce ones will be key to feeding a growing global population, set to reach 9 billion by 2050, without damaging the environment or accelerating climate change, he said. Food production must rise by about 60 percent by 2050 to generate enough for everyone to eat, according to the United Nation’s Food and Agriculture Organisation (FAO). Agriculture already accounts for 70 percent of global fresh water use, while the food sector is responsible for more than 20 percent of planet-warming emissions and 30 percent of world energy consumption. “We can no longer make solutions that come at the expense of other sectors,” said Hauge. “There is a need for a more integrated approach”. 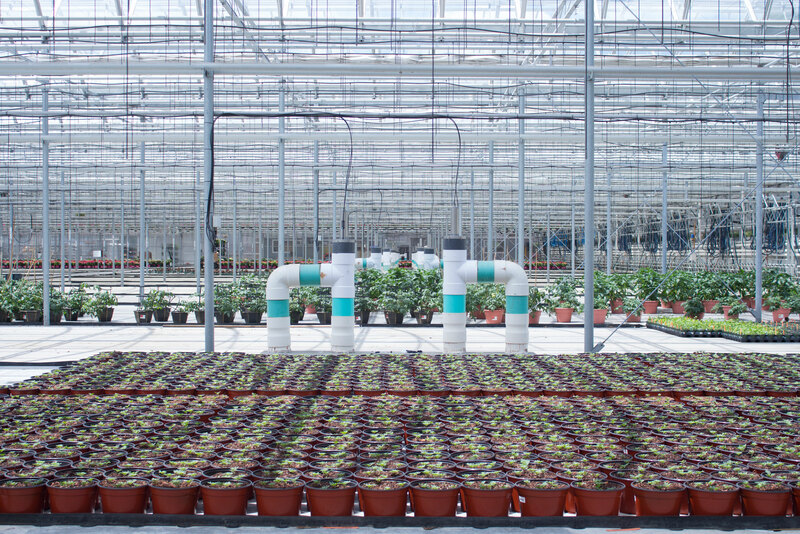 The Aqaba complex, set to open in the summer, evaporates salt water piped from the nearby Red Sea to cool greenhouses, creating conditions for crops to grow all year round. 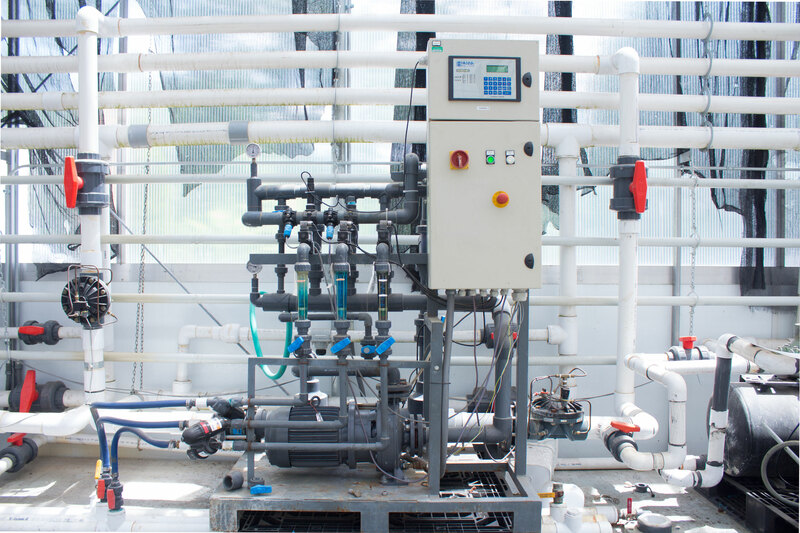 Sea water is also desalinated to generate salt and fresh water for irrigation, while vapour from greenhouses is used to humidify surrounding patches of parched land so plants can grow. SFP said a pilot project in the Gulf state of Qatar generated cucumber yields comparable to those of European farms. Plans are underway to expand operations to Tunisia. But FAO experts said high costs involved limited the potential of such projects to ramp up food production on a global scale. “You need a lot of energy and a lot of money so…the question may arise whether the same resources could be put to better use,” said FAO natural resources officer Alessandro Flammini. To be financially viable, production must focus on high-value crops, like cucumbers and tomatoes, which poor countries might find cheaper to import, said Flammini, who analysed the Qatar pilot for a 2014 FAO report. “It’s an interesting concept for fulfilling local needs and especially in terms of food independence and to meet the demand of a niche market,” he said. The Aqaba complex had a $3.7 million budget and received financial support from Norway, the European Union and other investors, according to SFP. Hauge said besides producing food, the complex, which will include a laboratory and research facilities, would produce side benefits by greening arid areas and creating jobs. “We believe that this is part of the agriculture of tomorrow,” the biologist-turned-entrepreneur told the Thomson Reuters Foundation by phone. Several other companies are employing similar technologies in other arid corners of the world. In 2016, UK-based agribusiness Sundrop Farms Holding opened a vast greenhouse for tomato farming in the Australian outback near Port Augusta, 300 km north of Adelaide. The facility runs on energy mostly produced by a 115 metre solar tower that draws sunlight from 23 000 mirrors surrounding it. “Traditional agriculture is wasteful in terms of water and fossil fuels. In addition, unprotected crops are at the mercy of the elements, causing gaps in supply, quality issues and price spikes,” Sundrop’s CEO Philipp Saumweber said in an email. The company has signed a 10-year contract to supply Australian supermarket chain Coles with truss tomatoes and received investments of about $100 million from private equity firm KKR & Co, according to a 2014 statement. “While the capital expenditure required to build our farms is slightly more expensive due to its cutting-edge nature, we reap the benefits of this initial investment in the long run through savings of fossil inputs,” said Saumweber. 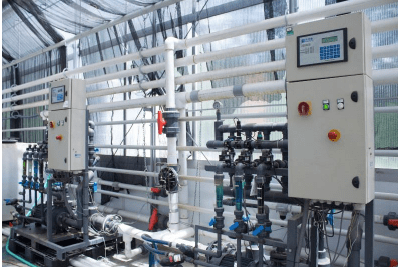 Around seven thousand miles away, in sunbaked and drought-hit Somaliland, another British-based venture, Seawater Greenhouse, is setting up a pilot facility aimed at making high-tech greenhouse production more affordable. “We have eliminated using fans,” said British inventor Charlie Paton, a former business partner of Saumweber, who pioneered the use of solar energy and salt water for irrigation in the 1990s. “We designed [the greenhouse] to be cool by exploiting the prevailing wind. So it’s a wind-cooled greenhouse,” he said in a phone interview. The one-hectare complex, which received funding from the British government, cost about $100 000, he said, adding he expected it to produce around 30 tonnes of tomatoes a year and 16 litres of drinking water a day for irrigation and livestock. Paton said he hoped the greenhouse, which employs mostly local staff, would serve as a hub for expansion across the Horn of Africa. “The region gets a lot of humanitarian aid and that’s arguably detrimental because if you give free food to people you put farmers out of business,” he said.